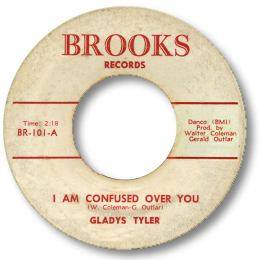 I guess Gladys Tyler came from New York – certainly her recording career stated there with the lovely gentle doo-woppish ballad I Am Confused Over You. She had a very big voice, full of gospel touches and an excellent sense of dynamics. I love the chorded organ and tenor sax pulses behind her as well. 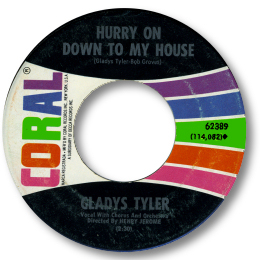 Her Coral 45 “Hurry On Down To My House” was a fine big city beat ballad, and I have a soft spot for her version of the standard “I’m In The Mood For Love” thanks to her spirited vocal and the cooing male background singers and an organ player who certainly knew his stuff. But her two Decca 45s were considerably better than this. The first featured a pounding R & B beater of great power in A Little Bitty Girl. Gladys wrote this one and if it refers to herself then for a small woman she could certainly belt out a song! This disc showed she was earning a living as the vocalist with Ray Scott’s Scottsmen at the time, and when they went to Memphis to record she went too. You’d better put your li’l old son on the track team"
Listen to that woman holler! Could she swing a tune! This leaves you quite breathless. Amazingly enough it’s so catchy that even the Northern dancers have noticed it. 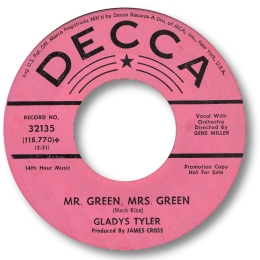 I just wish Gladys Tyler had recorded more material – she certainly deserved to be a big big star.